WIN! 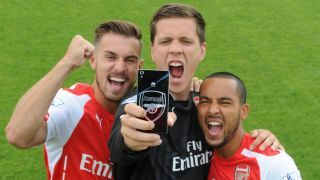 A new Huawei smartphone, Arsenal shirt and YouView+ Box! We've teamed up with Huawei, the official smartphone partner for Arsenal FC, to give away a brilliant prize: an exclusive Huawei Ascend P7 Arsenal Edition device, Huawei YouView+ box and 2014/15 Arsenal replica shirt. The Huawei Ascend P7 Arsenal Edition comes with some of the world's best football apps preloaded such as match highlights on the BBC iPlayer and games like FIFA 14 (mobile) — and with a 5-inch full HD screen, it's perfect for enjoying match highlights at home or on the go! To keep fans up to date, Huawei have partnered with the BBC to preload a bunch of great apps: BBC News, BBC Sport and BBC iPlayer Radio, as well as the brilliant new Yakatak app. Yakatak is perfect for updates on games as they happen and a unique direct link to your social networking friends to chat about Arsenal and clubs from 400 leagues. The 13MP main camera will let fans capture incredible videos of their heroes at Emirates Stadium and personalise every picture and video with added watermarking and audio functions. To be in with the chance of becoming one of the two winners of the Huawei Ascend P7 Arsenal Edition, Huawei YouView+ box and Arsenal shirt, simply enter your email address below!